ALLOY DESCRIPTION AND APPLICATION; USA 7018 is the most efficient general purpose, iron powder – low hydrogen electrode used for welding carbon steels, free-machining steels and low alloy steels with minimum yield strength of 50,000 psi. USA 7018 has a very good deposition rate, providing a quiet steady arc with low spatter and medium penetration. Weld deposits are of X-ray quality with easy slag removal, exceptional mechanical properties and a smooth uniform bead appearance. USA 7018 has excellent operator appeal and may be used in any position with AC or DC (reverse polarity). 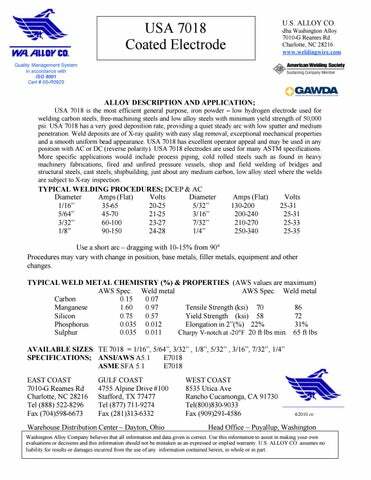 USA 7018 electrodes are used for many ASTM specifications. 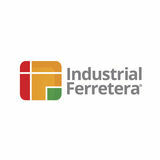 More specific applications would include process piping, cold rolled steels such as found in heavy machinery fabrications, fired and unfired pressure vessels, shop and field welding of bridges and structural steels, cast steels, shipbuilding, just about any medium carbon, low alloy steel where the welds are subject to X-ray inspection. Washington Alloy Company believes that all information and data given is correct. Use this information to assist in making your own evaluations or decisions and this information should not be mistaken as an expressed or implied warranty. U.S. ALLOY CO. assumes no liability for results or damages incurred from the use of any information contained herein, in whole or in part .